John Sullivan (February 17, 1740 – January 23, 1795) was an Irish-American General in the Revolutionary War, a delegate in the Continental Congress, Governor of New Hampshire and a United States federal judge. Sullivan, the third son of American settlers, served as a major general in the Continental Army and as Governor (or "President") of New Hampshire. He commanded the Sullivan Expedition in 1779, a scorched earth campaign against the Iroquois towns that had taken up arms against the American revolutionaries. As a member of Congress, Sullivan worked closely with the French Ambassador to the US, the Chevalier de la Luzerne. Born in Somersworth in the Province of New Hampshire, Sullivan was the third son of Irish settlers from the Beara Peninsula in County Cork ; his father was a schoolmaster. One of his brothers, James Sullivan, became Governor of Massachusetts. Another brother, Benjamin, who served in the Royal Navy died before the American Revolution. A landing party from HMS Allegiance on February 14, 1781 kidnapped another brother, Captain David Sullivan, who later died of disease. The father, John Owen ("Eoghan") O'Sullivan was the son of Philip O'Sullivan of Beare of Ardea, minor gentry in Penal Ireland and a scion of the O'Sullivan Beare Clan, Ardea Castle line. The Penal Laws reduced them (as Catholics) to the status of peasants. After emigrating to York, Maine, in 1723, the elder John became a Protestant. Sullivan read law with Samuel Livermore of Portsmouth, New Hampshire between 1758 and 1760. He began the practice of law in 1763 at Berwick, now in Maine, and continued in the practice when he moved to Durham, New Hampshire in 1764. He annoyed many neighbors in his early career, when he was the only lawyer in town, with numerous suits over foreclosures and was threatened with violence at least twice in 1766. But by 1772, he was firmly established and began work to improve his relations with the community. He also expanded his interests into milling from which he made a substantial income. In 1773 Alexander Scammell joined John Sullivan's law practice. Sullivan built a friendship with the royal governor of New Hampshire, John Wentworth, who had assumed the office in 1767. In November 1772, Wentworth appointed Sullivan a major in the militia. As the American Revolution grew nearer, Sullivan turned away from Wentworth and began to side more with the radicals. On May 28, 1773, at the urging of the Virginia House of Burgesses, the New Hampshire Assembly established a Committee of Correspondence. Hoping to thwart the committee, Wentworth adjourned the Assembly the next day. On December 16, 1773, colonists in Massachusetts destroyed tea worth 15,000 pounds at the Boston Tea Party to protest taxes under the Tea Act. The British Parliament responded with the Boston Port Act, effective March 21, 1774, which closed the Port of Boston until restitution for the destroyed tea was made to the East India Company. Parliament went on to pass the Massachusetts Government Act, which removed many functions of government from local control, the Quartering Act, which permitted quartering of troops in towns where there was disorder, and the Quebec Act, which established the Catholic religion and French civil law in that province. In response to Wentworth's action dismissing the Assembly and the call for a continental congress to support Boston after the British sanctions against it, on July 21, 1774 the first Provincial Congress of New Hampshire met at Exeter, New Hampshire, with John Sullivan as Durham's delegate. That assembly sent him and Nathaniel Folsom as delegates to the First Continental Congress. The assembly adopted a Declaration of Rights and Grievances on October 14, 1774. By November 8, Sullivan and Folsom were back in New Hampshire to work for acceptance of the Declaration and the Association of the colonies to support economic measures to achieve their objectives. On October 19, 1774, a royal order in council prohibited the export of powder and arms to America and Lord Dartmouth secretly wrote to the colonial governors to secure gunpowder, arms and ammunition in the provinces. After Paul Revere was sent by the Massachusetts committee to warn the Portsmouth militia of a rumored British movement toward Fort William and Mary, that militia raided the fort and seized gunpowder on December 14, 1774. Sullivan, who was not present on this first raid, was one of the leaders of the militia force who made the second raid on the fort for its cannon, muskets and munitions on December 15. Sullivan and his men took 16 cannons, about 60 muskets and other stores but were prevented from returning for other cannon and supplies by the arrival of the man-of-war Canceaux, followed two days later by the frigate Scarborough. Wentworth refrained from seeking to arrest Sullivan and others because he thought he had little popular support and the militia would not act. In January 1775, a second Provincial Congress at Exeter voted to send Sullivan and John Langdon to the Second Continental Congress. Sullivan, supported by Folsom and Langdon, persuaded the assembly to petition Wentworth to call a New Hampshire Assembly that he would not dissolve. Wentworth responded by dismissing Sullivan from the militia and further postponing the meeting of the assembly. Since Wentworth believed he had little power to arrest Sullivan and other leaders of the extra–legal assembly, Sullivan and Langdon started traveling to Philadelphia. Upon arrival in Philadelphia, Sullivan joined those who argued that war had been started by the actions at the Battles of Lexington and Concord and that the colonies should proceed with it. Congress soon decided that they must take charge of the army forming around Boston. They appointed George Washington as commander in chief and several other generals, including John Sullivan as a brigadier general. On June 27, 1775, Sullivan left Philadelphia to join the army at the siege of Boston. After the British evacuated Boston in the spring of 1776, Washington sent Brigadier General Sullivan north to replace the fallen John Thomas as commander in Quebec. He took command of the sick and faltering invasion force, sent some of those forces on an unsuccessful counterattack against the British at Trois-Rivières, and withdrew the survivors to Crown Point. This led to the first of several controversies between Congress and General Sullivan, as they sought a scapegoat for the failed invasion of Canada. He was exonerated and promoted to major general on August 9, 1776. Sullivan rejoined Washington and was placed in command of the troops on Long Island to defend against British General Howe's forces about to envelop New York City. But then, on August 23, Washington split the command between Sullivan and General Israel Putnam, with Putnam being the senior general. Confusion about the distribution of command contributed to the American defeat at the Battle of Long Island four days later. Sullivan's personal bravery was unquestioned, as he engaged the Hessian attackers with a pistol in each hand; however, he was captured. General Howe and his brother, Admiral Richard Howe, managed to convince Sullivan that a conference with members of the Continental Congress might lead to peace, and released him on parole to deliver a message to the Congress in Philadelphia, proposing an informal meeting to discuss ending the armed conflict between Britain and its rebellious colonies. After Sullivan's speech to Congress, John Adams cynically commented on this diplomatic attempt, calling Sullivan a "decoy-duck" and accusing the British of sending Sullivan "to seduce us into a renunciation of our independence"; others noted that it appeared to be an attempt to blame Congress for prolonging the war. Congress did agree to a conference, which accomplished nothing. 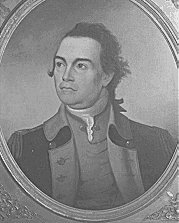 General Sullivan was released in a prisoner exchange (for captured British officer Richard Prescott) in time to rejoin Washington before the Battle of Trenton. There his division secured the important bridge over the Assunpink Creek to the south of the town. This prevented escape and ensured the high number of Hessian prisoners captured. In January 1777, Sullivan also performed well in the Battle of Princeton. In August, he spoke out against the neutrality of Quakers in the American Revolution, and led a raid on Staten Island. Again Congress found fault, but he was exonerated by the court of inquiry. This was followed by American losses at Brandywine and Germantown. During the Battle of Brandywine in September 1777, he and his troops were bivouacked at Brinton's Ford adjacent to Brinton's Mill. Sullivan's men were attacked and sent into retreat by a surprise flanking attack at Brandywine but were eventually able to leave the field in good order when they were reinforced by troops under the command of General Nathanael Greene. In the initial attack at Germantown, Sullivan's men routed British light infantry. Fog, a friendly fire incident, and delayed troop movements due to wrong turns, ruined Washington's plan and sent both Sullivan's troops back under unexpected friendly fire and Greene's men back due to the absence of some subordinate commands. In early 1778 he was transferred to the post of Rhode Island where he led Continental troops and militia. It was intended he work together with a French Navy fleet to assault or besiege British-held Newport which was regarded as extremely vulnerable since France's entry into the war. The attempt was called off when the French fleet of Admiral d'Estaing was scattered and damaged by a storm. Owing to the damage to his ships, and discouraged by the arrival of a British fleet under Lord Howe, D'Estaing withdrew to Boston. The British garrison of Newport then sortied, forcing Sullivan into retreat after fighting the inconclusive Battle of Rhode Island in August 1778. The failure to defeat what appeared to be a very vulnerable garrison, and the manner in which the campaign collapsed, provoked a major rift in Franco-American relations. Sullivan wrote a letter to D'Estaing protesting what he saw as treachery and cowardice and describing it as "derogatory to the honor of France". The failed campaign sparked an international incident between the two allies, and was followed a year later by another unsuccessful attack on a British garrison at the Siege of Savannah. The debacle did not badly affect Sullivan's career, and he was considered as a potential commander for a possible invasion of Canada. In the summer of 1779, Sullivan led the Sullivan Expedition, a massive campaign against the Iroquois in western New York. During this campaign, troops destroyed a very large Cayuga settlement, called Coreorgonel, on what is now the southwest side of Ithaca, New York. To reach the enemy homeland, Sullivan's army took a southernly route to western New York through northeast Pennsylvania, which required creating a new road through lightly inhabited areas of the Pocono Mountains, which still exists and is known as Sullivan's Trail. He pushed his troops so hard that their horses became unusable, and killed them on this campaign, creating the namesake for Horseheads, New York. The lukewarm response of the Congress was more than he could accept. Broken, tired and again opposed by Congress, he retired from the army in 1779 and returned to New Hampshire. Around this time, Sullivan was approached by British agents who tried to persuade him to switch sides. This was part of a concerted effort of approaches to other Generals such as Moses Hazen, Ethan Allen and Benedict Arnold who it was believed were unhappy with their treatment by Congress and had lost their faith in the goal of American independence. It was a strategy with mixed results—but which produced the notable defection of Arnold. At home Sullivan was a hero. The New Hampshire legislature selected him as a delegate to the Continental Congress for one year to start in November 1780, against his wishes. Although most of the delegates to Congress were new, Sullivan still had opponents there. Nonetheless, he accepted the position in order that New Hampshire be represented in the controversy concerning claims to Vermont under the New Hampshire Grants. In the absence of other delegates from New Hampshire except the soon to depart Nathaniel Folsom, Sullivan was seated early, on September 11, 1780. Immediately, Sullivan and Folsom had to deal with the question of whether Vermont would be part of New York or New Hampshire or would be independent. Ultimately, since possible negotiation of Vermont with the British to become a part of Canada was threatened, on August 3, 1781, Sullivan seconded appointment of a committee to negotiate with Vermont on becoming a separate state. In late 1780 or early 1781, Sullivan, who often claimed to be in financial straits, borrowed money from the French minister to Congress, probably with no intent or expectation of repayment. Sullivan already supported positions favorable to the French in Congress, but historian Charles Whittemore described Sullivan's conduct as "ethically obtuse" and as tarnishing his reputation. Yet, Sullivan worked to help the country and government on several matters such as seeking French financial support for the United States. Later in the year, Sullivan worked to get people appointed as peace negotiators, especially Benjamin Franklin, who were favored by the French because they might not insist on western land claims and thereby help shorten the war by eliminating that issue. Of course, Sullivan alone could not have attained results on such matters without majority support. One of Sullivan's last acts was to vote for Robert Livingston for appointment to the position of United States Secretary of Foreign Affairs. Returning home to New Hampshire, he was named the state's attorney general in 1782 and served until 1786. During this same time he was elected to the state assembly, and served as speaker of the house. He led the drive in New Hampshire that led to ratification of the United States Constitution on June 21, 1788. He was elected President of New Hampshire (now Governor) in 1786, 1787 and 1789. During his first term as governor, he put down the Exeter Rebellion. When the new federal government was created, President George Washington nominated him on September 24, 1789, to be the first federal judge for the United States District Court for the District of New Hampshire, created by 1 Stat. 73. He was confirmed by the United States Senate on September 26, 1789, and received his commission the same day. Although his health prevented his sitting on the bench after 1792, he held the post until he died on January 23, 1795, aged 54, at his home in Durham. He was interred in the family cemetery there. He was first Grand Master of the Grand Lodge of New Hampshire and had been a member of St. John's Lodge, Portsmouth, New Hampshire since 1767. Counties in New York, Pennsylvania, New Hampshire, Tennessee, and Missouri were all named for him, as was Sullivan Street in Greenwich Village, Manhattan. The General Sullivan Bridge spanning Little Bay near his home town of Durham, New Hampshire, is named for him, as is Sullivan Trail, a road through northeast Pennsylvania that in many areas follows the road made by Sullivan's army in 1779. Towns in Illinois, New Hampshire, New York, and Ohio are named after him. Sullivan's Bridge, a future bicycle and pedestrian bridge crossing the Schuylkill River at Valley Forge National Historical Park, is also named in his honor. Part of the march route into Trenton, New Jersey is named Sullivan Way. Bostonians still celebrate the evacuation of British forces each year on Evacuation Day, which coincides with Saint Patrick's Day. According to local legend, Sullivan used "Saint Patrick" as the official password the day he led Colonial troops into Boston. ^ a b O'Connor, Thomas H. (1995). The Boston Irish: A Political History. Boston: Northeastern University Press. pp. 12–13. ISBN 9781555532208. ^ "National Historic Landmarks & National Register of Historic Places in Pennsylvania" (Searchable database). CRGIS: Cultural Resources Geographic Information System. Note: This includes Eleanor M. Webster (June 1970). "National Register of Historic Places Registration Form: Brinton's Mill" (PDF). Retrieved December 23, 2012. ^ "Replacement of the Old Betzwood Bridge (Sullivan's Bridge)". GVF Transportation. Retrieved May 10, 2014. Fischer, David Hackett (2004). Washington's Crossing. New York: Oxford University Press US. ISBN 978-0-19-518159-3. OCLC 186017328. Trevelyan, Sir George Otto (1903). The American Revolution: 1766–1776. London & New York: Longmans, Green. OCLC 8978164. Upton, Richard Francis. Revolutionary New Hampshire: An Account of the Social and Political Forces Underlying the Transition from Royal Province to American Commonwealth. Hanover, NH: Dartmouth College Publications, 1936. OCLC 753114879. Retrieved 2013-09-12 – via Questia (subscription required). Whittemore, Charles P. A General of the Revolution: John Sullivan of New Hampshire. New York, Columbia University Press, 1961. OCLC 426098. Retrieved 2013-09-12 – via Questia (subscription required). "John Sullivan". Biographical Directory of the United States Congress. John Sullivan at the Biographical Directory of Federal Judges, a public domain publication of the Federal Judicial Center. This page was last edited on 4 April 2019, at 11:03 (UTC).